If you are thinking about acquiring a cat or you have a new kitten that needs training, this is the best place for you to be right now! If you have always been a dog person rather than a cat person you are in for a few surprises. Unlike Fido, who will go to great lengths to win your approval and adapt to his new home, Kitty expects the home to adapt to him or her! What are the secrets to breaking through your cats illusive aura of mystery and can you breach it? What is the best method for training my cat? Theres finally a new, breakthrough book created just for cats and their owners! And, if you really want to have a healthy, well behaved pet then this book is definitely for YOU! There is much more about having a cat than you may have thought about and Feline Royalty - Who rules the roost in your home? is just what you need to answer those questions. How to select a cat breeder - A cats lifespan is normally 20 years or more, depending on the care it is given. Choosing a responsible breeder will make your cat not only healthier, but live longer. Selecting a breed of cat - Top cat breeds. If you want to show off your cat then it is best to choose from among the top five cat breeds throughout the world. Choosing a name for your cat - When you give a different name to a cat, you are welcoming him to your family. How to litter train your cat - With enough time and patience, you can learn to litter-train your pet cat and succeed while doing so. A Breeders choice of cat box - There is a wide variety of designs, styles and features for cat litter boxes. Learn how to select the correct one for your cat. Selecting the right cat litter - There are a variety of cat litters to choose from. Learn tips and advice about making the correct selection for your cat. A Breeders choice in cat litter What do the experts have to say abut choosing cat litter? What about those automatic litter boxes? Is it right for your cat? How to select a scratching post - Take care in choosing the right post for your cat or he may not use it! Training your cat to use the scratch post - The only thing to remember is that to prevent your cat from scratching your furniture is to provide her with something better to scratch. Should your cat be de-clawed? - Scratching is a basic physiological need of cats. So do cats need to be de-clawed? This is a controversial question addressed inside the book. Grooming your cat - Although your feline friends groom on their own, you should still do your part in keeping your cat clean and well-groomed. Learn what the steps are inside the book. Selecting cat toys - Cats have the tendency to both play hard and play soft. Toys are to cats the same as toys are to dogs. Learn which are better for your purposes. Training your cat to co-exist with your dog - In this chapter is a series of steps to finding harmony between cats and dogs. Getting the answers to these and other compelling questions is a must for anyone who is considering adding a cat or kitten to their family. Thats right! You are adding a new member to your family and just like bringing home a new baby your life will change. Use the tips and information we offer in Feline Royalty - Who rules the roost in your home? you can ensure it will be a delightful experience. Be prepared. 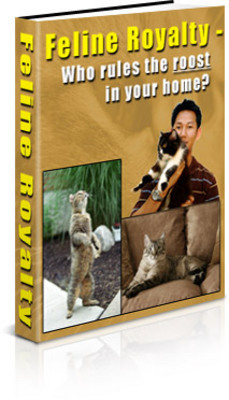 Get all the answers you need in just 90 seconds or less by clicking Feline Royalty - Who rules the roost in your home?